Attached are photos of my finished tipi, made of medium-weight duck canvas fabric purchased from JoAnn’s with a coupon! I sewed my entire tipi using my BERNINA 830. It was a pleasure to use my workhorse of a sewing machine to do this job. As you can see there was plenty of yardage to wrangle and my BERNINA took care of it without complaint. I oiled it after the first day of sewing, according to BERNINA’s manual instructions. I chose an extra strong sewing needle size 16/100 and that one needle did the whole job without breaking or bending. I decided that polyester hand-quilting thread was the best choice after I tested all the quilting thread for breakage (by tugging on the thread with my bare hands). I just want to express what a pleasure any sewing job is on my BERNINA and I had lots of confidence in my BERNINA’s performance even before attempting my 14 foot diameter tip. I took the tipi to Oregon and slept inside for one week. You can see in the photos the overcast sky as the tipi was set up. The rain poured the first night and I stayed cozy and dry inside, thanks to those strong “blue jean” seams that were so easy to sew on my BERNINA 830. So now I have a fine house to camp in and play in, thanks to your marvelous sewing machine! I can’t believe it! it’s so awesome! Love this tipi!! What a terrific project! I am inspired to make something BIG, fun and functional on my beloved Berninas………..
Congratulations…what a unique wonderful project. The 830 is amazing, I bet you are glad you own one. It inspires all to step out of the box and make a dream happen! You should paint some decorations to give it native appeal. Happy Camping! I can’t believe that you made that. I am so incredibly impressed. You must have a lot of patience to see that big of a project through. Here in Indian territory I’ve seen hundreds of them and I think yours is very impressive. What a great job and I know you enjoy it to camp in…Congratulations….question…..what have you used for your closure? It looks like sticks…is it? What beautifully-stitched work! It looks like a massive undertaking for both you and the Bernina, and it looks like you both came through beautifully. What else are you sewing with your Bernina 830? wow!! i would love to make this – do you still have the pattern you used? can you share it? Thanks for your encouragement, Carol. Yes those are ordinary straight wood sticks with the ends sharpened to a point. (whittled them with my Morro knife.) Eight of them are evenly spaced to close the seam, so to speak. It’s a strong hold accomplished by slipping the sticks through two holes in both layers, as is the traditional method. I made the holes by poking through the canvas (which was lined with a second layer for extra strength) using a sharp metal awl. As I pushed the sticks through, they stretched the holes bigger and stayed in tightly. Later, I’ll stitch all the holes to re-enforced the edging and prevent fraying–probably using the darning stitch on my Bernina 830. Hi Jean, The pattern for a tipi is a half circle with two smoke flaps added at on either side of the mid point of the circle. 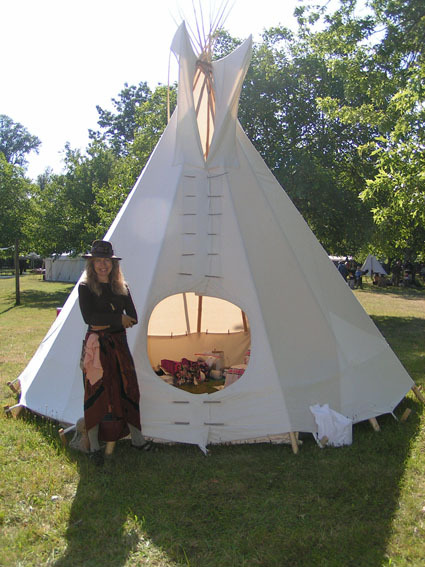 I googled tipi images online to get some ideas and kept the same ratios, but not the same size as the example-which was a 18 foot tipi. The neat thing about a tipi is that it’s a cone, made from a semi circle. To gain confidence, I recommend making a small, doll-sized tipi and find small stick tipi poles to set it up. Then scale it up from there. 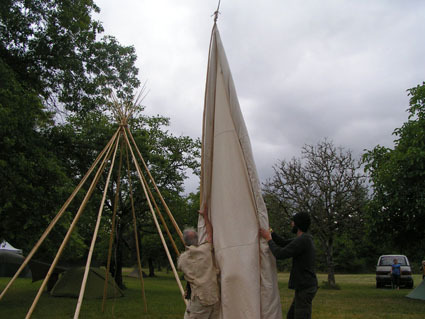 The diameter of the base of the cone is equal to the side of the tipi. In other words, if you cut the cone in half vertically, you get an equilateral triangle. 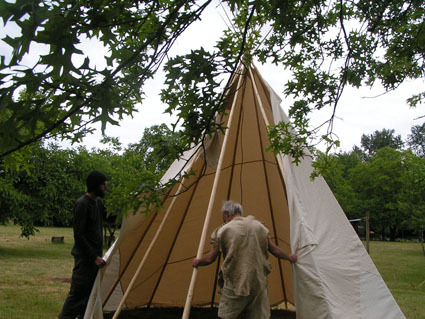 I decided to make a 14 foot diameter tipi, which comfortably fits three adults. I sewed three strips of canvas (pre-shrunk) into a large rectangle (14 x 28 feet) and laid it out on a big floor at my local recreation center one night when it was empty. Then my friend helped me with his measuring tape to pivot a 14 foot length around the center of the top side of the rectangle to trace out a semi-circle. 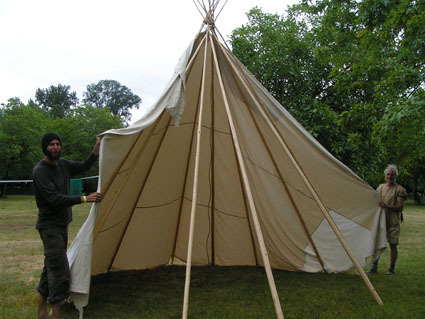 I almost made a 12 foot tipi, but realized that with just a little more material, I could get 3 times more volume inside. (Volume increased cubically, while the surface area increases squared.) Hope this help clarify your questions.